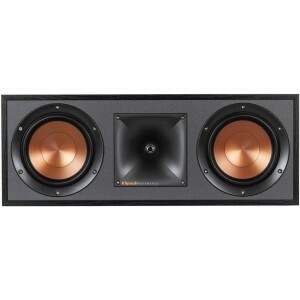 High quality stylish centre speaker from Klipsch's Reference base range sitting below the larger R-34C centre speaker. Earn 235 loyalty points when you order this item. Klipsch R-52C delivers crystal-clear sound for your movie dialogue and music lyrics with incredible acoustics. Klipsch's proprietary Tractrix horn-loaded technology gives you a lifelike, front-row listening experience unlike any other. Klipsch exclusive Tractrix horn technology delivers the power, detail and emotion of the live music experience with the cleanest, most natural sound possible. Exposed fasteners and low profile magnetic grilles give the speakers a polished, modern appearance. MDF cabinet with scratch-resistant, textured wood grain vinyl gives a stylish aesthetic with absolute durability that results in a seamless integration into any décor. Reinforced MDF construction reduces cabinet vibration for less audible colouration and improved sonic accuracy.